Summer 2014—To succeed in the rapidly changing business world, you must be nimble enough to adapt. Last summer a group of Carson College of Business students got a crash course in acclimation through a faculty-led study abroad program on the Greek island of Crete. 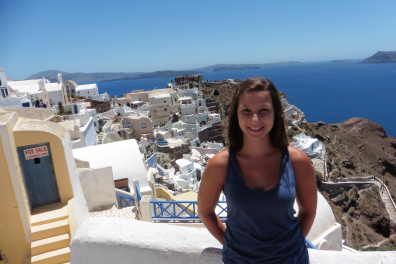 Management senior Allison Thomas was among the students who spent four weeks immersed in a new environment and a different culture. Thomas and her classmates spent weekdays in class, taking courses required for the major. While the environment was completely new, the instructor provided a familiar tether to home. Courses were taught on site by a professor from the Pullman campus. Weekends were reserved for exploration. 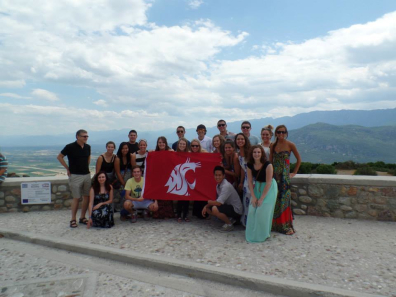 The students visited historical sites—the Acropolis, monasteries in Meteora, and Delphi. They hiked through Samariá Gorge (a National Park of Greece), snorkeled in crystal blue waters, and relaxed on a breathtaking beach with pink sand, alongside the ruins of an ancient settlement. “It made me realize just how different life is in other countries, and how much I haven’t seen yet.” Thomas said. The International Experience Requirement (IER) equips you with a global perspective that gives you a competitive edge in your career.Get details about faculty-led study abroad program destinations.